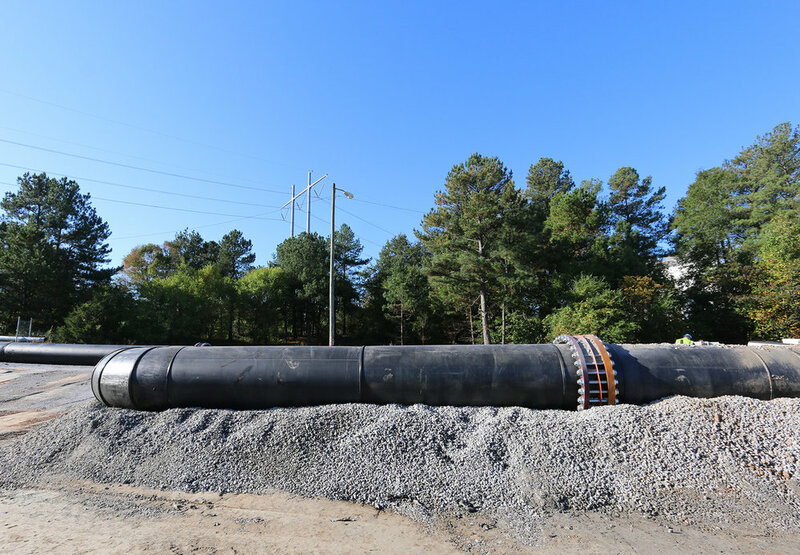 PHOTOS Vogtle Electric Generation Station Units 3 and 4 RCC — Morgan Corp.
Morgan Corp. provided a total site preparation and pavement package for construction of two new AP1000 Model, 1100Mw Nuclear Power Generating Units, covering over 1,000 acres of land disturbance. The project included laydown areas, craft and management parking areas, access roads, cooling towers, on-site batch plant area, and future switchyard. Work performed included clearing, grubbing, and grinding of 670 acres; design, construction, and maintenance of a 50-acre multi-staged surface and subsurface dewatering system for two 90-foot-deep nuclear island excavations, as well as construction of 70 acres of roller-compacted concrete pavements over soil-cement pavement base layer. RCC construction at Vogtle started in 2011 to build an approximately 45 acre parking lot. The original design called for a flexible pavement section consisting of 2 inches of hot mixed asphalt over 6 inches of graded aggregate base. Morgan Corp. proposed a value engineered RCC pavement section consisting of 4 inches of RCC over 6 inches of cement treated soil (CTS) base course. This value-engineered option was approved and used to build the parking lot pavement. Building on the success of the RCC at the parking lot, all remaining parking and laydown areas, access roads, heavy-haul roads, etc. were built with RCC over a CTS base layer. RCC thicknesses used on this project for various loading and traffic conditions included 4, 6, 7, 10 and 18 inches.